Twenty-one new cases were connected to a single yeshiva in Brooklyn. An ongoing measles outbreak in New York City's Orthodox Jewish community is continuing to spread, with nearly two dozen new cases linked to a single yeshiva, health officials said. The New York City Department of Health on Thursday announced 31 newly identified cases of measles within the Orthodox Jewish community in Brooklyn, the city's most populous borough, since the outbreak began in October. That brings the total case count to 121, of which a vast majority -- 108 cases -- were children under 18. Twenty-one of the new cases were connected to one yeshiva in Brooklyn's Williamsburg neighborhood, which didn't follow the health department's mandatory exclusions of students in selected ZIP codes who had not received the required number of doses of the measles-mumps-rubella vaccine. "This yeshiva went out of compliance with the Health Department’s exclusion order in mid-January, allowing an unvaccinated student who had measles but had not yet begun presenting symptoms," the health department said in a press release Thursday. Last week, the health department said it expanded vaccination recommendations for health providers serving the Orthodox Jewish community to include an early, extra dose of the vaccine for children between the ages of 6 months to 11 months who live in the Williamsburg and Borough Park neighborhoods. Although no one has died, eight patients have been hospitalized and one child was in an intensive care unit. 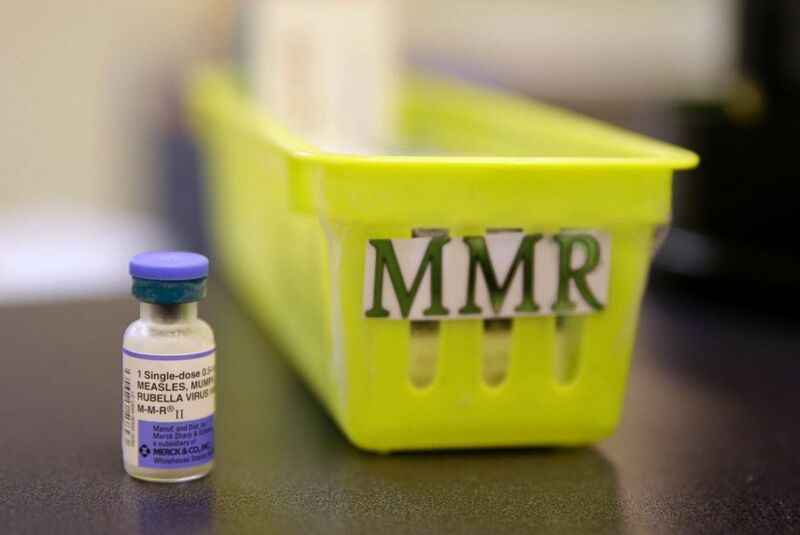 "As a pediatrician, I can’t stress enough how critical is to vaccinate children against measles," New York City health commissioner Dr. Oxiris Barbot said in a statement Thursday. "Measles is a serious, highly contagious and potentially deadly infection. Complications and fatalities are rare but do happen. I urge parents not to take any risks that may jeopardize their children or other children in their community." 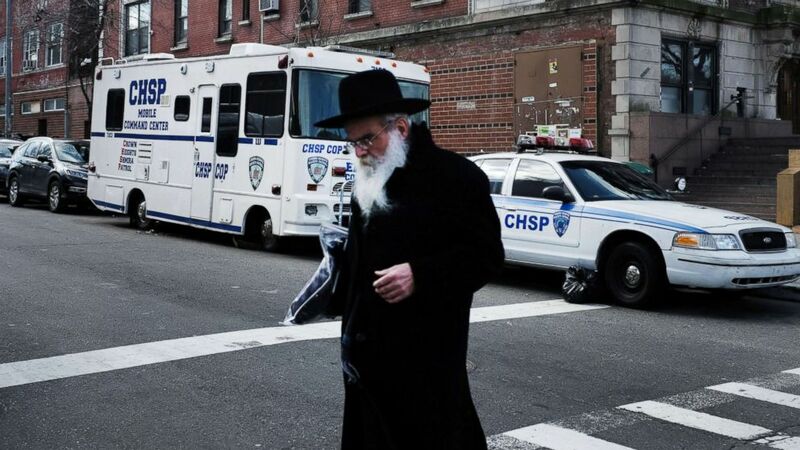 (Spencer Platt/Getty Images, FILE) An Orthodox Jewish man walks past a security vehicle in the neighborhood of Crown Heights, Feb. 25, 2019, in New York City. Measles is a highly-contagious, airborne virus that easily spreads through coughing and sneezing. It causes fever, runny nose, cough, red eyes and sore throat, followed by a rash. An infected person will start being contagious four days before a rash appears and will stop being contagious four days after rash onset, according to the Centers for Disease Control and Prevention. Measles is rare in the United States because of high vaccination rates, but the disease is still common in other countries. The ongoing outbreak in Brooklyn began when an unvaccinated child got infected during a trip to Israel, where a large outbreak is occurring, according to the New York City Department of Health. "It says in the Torah 'V’nishmartem Meod L’nafshoseichem,' that a person must guard their health," Rabbi David Niederman, president of the United Jewish Organizations of Williamsburg and North Brooklyn, said in a statement Thursday. "It is abundantly clear on the necessity for parents to ensure that their children are vaccinated, especially from measles."